Happy New Year everyone! This post is completely overdue as Christmas is wonderfully hectic in my family, especially as my birthday is on the 27th December, right inbetween all of the festivities! As a result, I didn't get around to doing much baking and when I did, they didn't hang around long enough for me to take photographic proof! 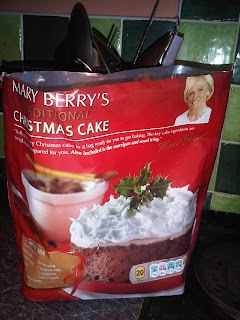 As I've never made a Christmas cake, I used Mary Berry's version of Delia's all in a bag cake. 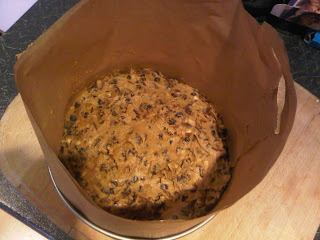 I hate Christmas cake, but the smell of the fruit and the spices really got me into a festive mood! As everything was measured for you, and pre soaked, it was the easiest way to make a Christmas cake. Unfortunately, as we've had far too many indulgences over the last few weeks, my cake is yet to be decorated or eaten, so I'll keep you all updated when it is! We also got our new oven just in time for Christmas, and I got straight on to making festive shortbread. I found some lovely little presentation bags in Morrison's and bagged them all up, ready to hand out to friends and family. As always, the photos for my bakes are either rubbish or non existent! Alongside Christmas cake and shortbread, I made peppermint creams and miniature bakewells, all of which were eaten so quickly that I didn't get to take any pictures! I promise that my New Years resolution is to take better pictures! Hope you all had a wonderful Christmas and New Year, all the best! Your shortbread looks lovely. Funnily enough it's not something I've ever made, no idea why! I'm intrigued by the mary berry bag cake, let us know how it turns out! 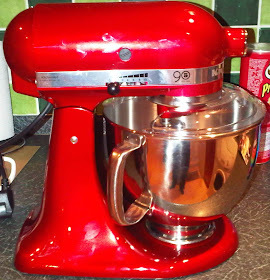 I just got a KitchenAid for Christmas, red too, so I'm really pleased to have found your beautiful blog and see some tried and tested KitchenAid recipes!! Yay!! Looks like you were busy!